Super steady and always ready, the AF-S NIKKOR 24-70mm f/2.8E ED VR workhorse is prepared to take your work to the next level. With up to 4 stops* of VR (Vibration Reduction) image stabilization, you can capture sharp, steady handheld stills and HD videos, and shoot at slower shutter speeds in low-light situations without sacrificing sharpness. Pair it with a Nikon full-frame high-resolution DSLR to capture the decisive moment with a thrilling balance of sharpness and soft blur effects. Covering the sweet spot of the zoom range with a fast f/2.8 constant aperture, you'll be ready for everything from environmental portraits, studio photography, landscape, architecture (exteriors and interiors), press events and weddings. 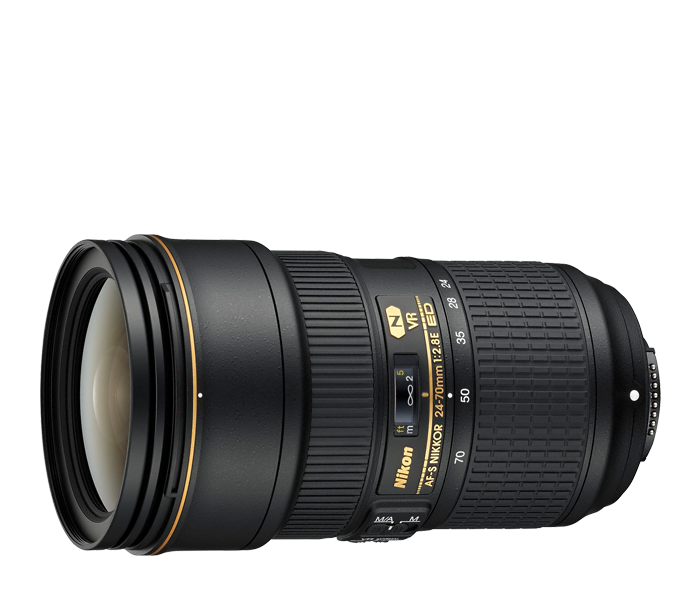 To complete the evolution, the AF-S NIKKOR 24-70mm f/2.8E ED VR also includes Nikon's Vibration Reduction image stabilization technology. It reduces camera shake and vibration up to ~4.0 stops*. Capture sharp, steady handheld stills and HD videos, and shoot at slower shutter speeds in low-light situations without sacrificing sharpness. Versatility, enhanced. With a highly durable build quality designed to withstand the severest shooting environments, Fluorine coatings on the front and rear elements for easy cleaning, a rear rubber gasket to help keep moisture out, the AF-S NIKKOR 24-70mm f/2.8E ED VR is ready for your toughest assignments.